POP FROM ALL ANGLES: Slug Guts - Spewing on America? 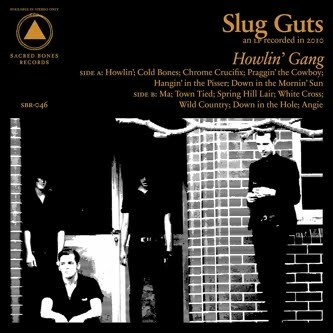 Sad I didn't get to hear Slug Guts' Howlin' Gang before I interviewed them back in January. It's everything Jimi Krizler promised and more. Howlin' Gang features an expanded roster, a new, equally dank/cruel singer, and an much wider scope and sound compared to Down on the Meat. As that album was grimy and anemic, but visceral nonethless, Howlin' Gang seems cinematic and prophetic. "Down in the Morning Sun," featuring Angie Bermuda of Circle Pit sharing vocal duties might even make you cry in it's damaging beauty. They've also talked about an upcoming tour through the states, which should be very welcomed given the status of bands like the Pit, Fabulous Diamonds and Naked on the Vague on American tongue. Here's footage of them as one of Oz's premiere scuzz-pub bands -- though heavy drink is prolly only an appetizer for this crew.